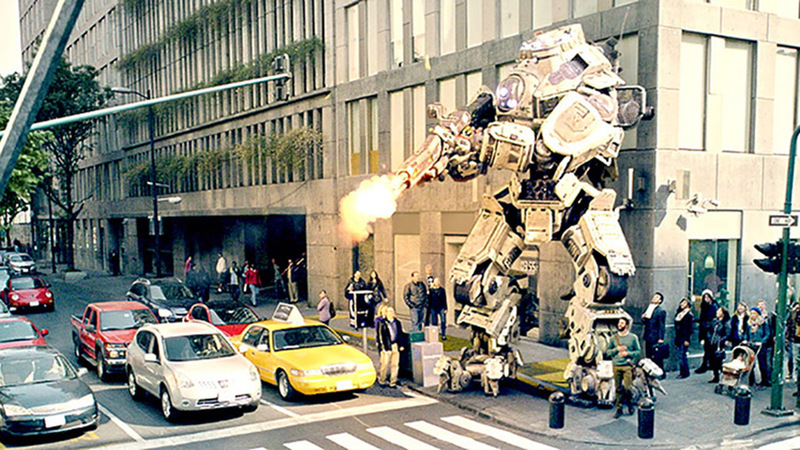 It's just the story of one regular guy and his CG titan taking on the streets. We take you "behind the work" for Titanfall's 'Shadow' to see how Mill artists brought the charismatic CG titans to life. 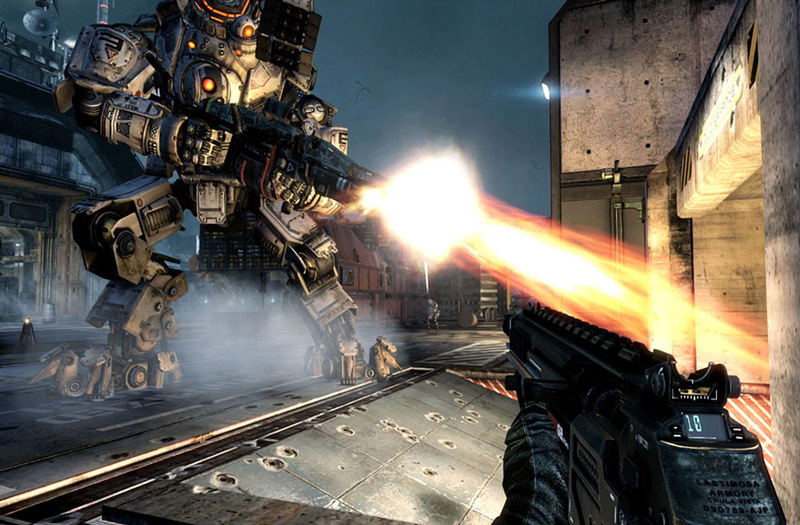 The Mill created the two CG titans featured in the new commercial for Titanfall, a first-person shooter video game franchise from Electronic Arts and Respawn Entertainment. 'Life Is Better With a Titan' is a 60-second CG blockbuster that brings the game experience into an everyday setting as our "average guy" character takes a stroll around the block ……shadowed by his 25-foot titan. Set to the tune of Sinatra’s “My Shadow and Me”, our character dominates the day… until he comes face to face with another man.. and his titan. 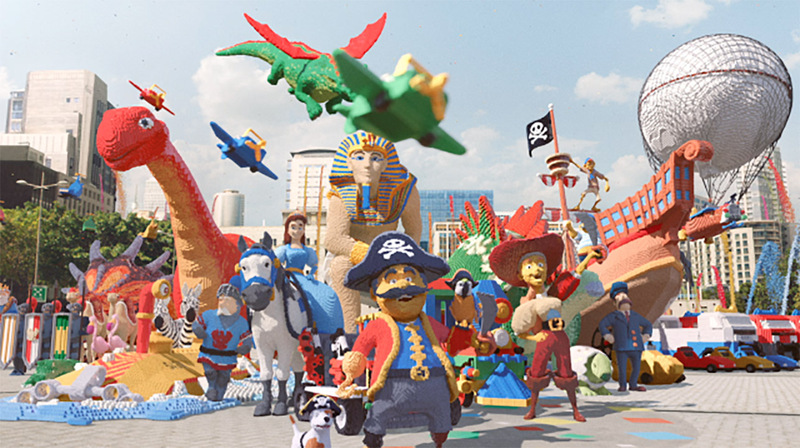 Shoot supervisor and creative director John Leonti shared some insight into the process: "On some jobs we plan the shot angles and durations so that when we arrive, we know exactly what we're going to shoot and how, effectively determining the end result. Without that, you kind of get there and see what works. You might end up with a completely different spot from what you imagined, which is kind of half the fun. Without previs, there are no preconceived ideas, which means you approach the environment with a fresher eye. When you arrive at the location, the photographic opportunities present themselves. It's not necessarily a 'better way', it's just a different way." This isn’t the 1st CG Titan The Mill has created. 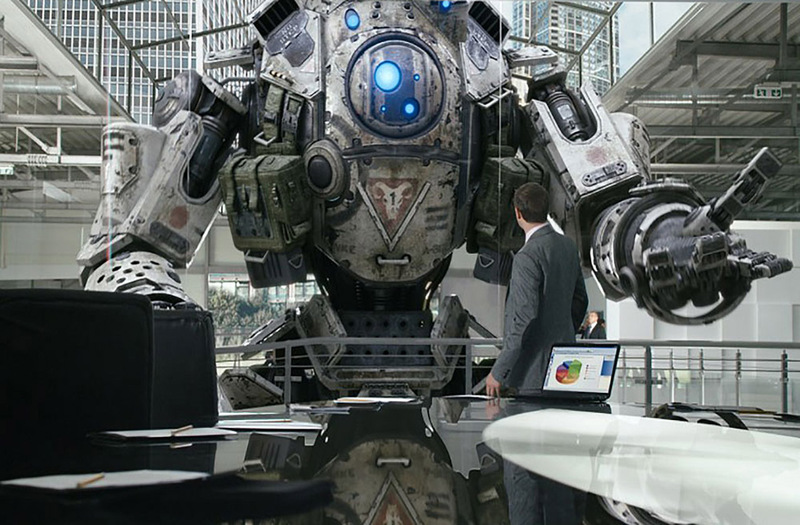 Xbox One’s “Invitation” features a giant Titanfall robot crashing from a roof into the middle of a conference room. 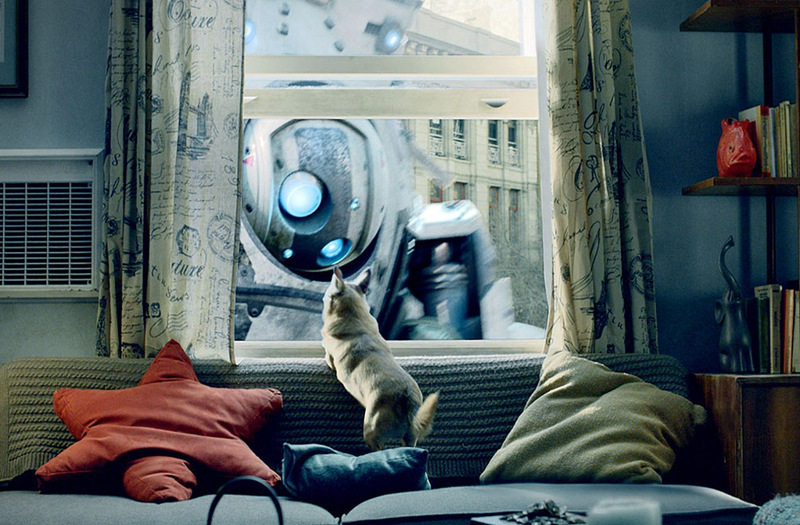 Unlike the more recent 'Life Is Better With a Titan' spot, we heavily pre viz'd the scene before the shoot, and worked out rough timings and angles for the shots. With a CG titan in every single shot of 'Life is Better With a Titan,' our look-development process was extremely important. 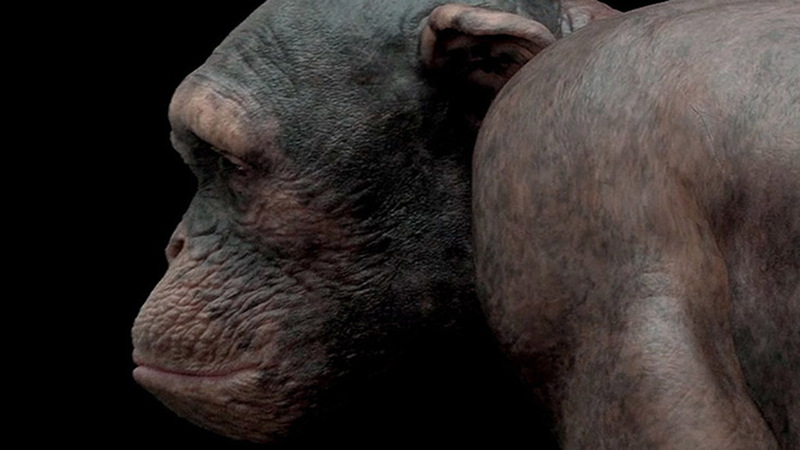 David Lawson, 3D lead artist, explains the approach “We didn't previs because we wanted Wayne (director) to have as much freedom as possible, but we did work closely with the creative team at Heat to achieve the titans’ strong, aggressive yet human characteristics. This included discussing key scenes during the storyboarding process, allowing us to begin modeling and texturing the titan in advance." We started with game assets from development studio Respawn. To achieve the level of detail we wanted, we remodeled and retextured the titan to provide realism in closeups. We have our own Arnold translator and our R&D team have made some great shaders that help to build an optimized rendering setup, allowing us to react immediately to changes as well as giving our director and clients the freedom to tweak story points. John Leonti and Phil Crowe, creative directors and shoot supervisors, both headed down to Mexico City for filming. "With such a big project came some interesting challenges," Leonti told us. "An example was the Mayor wanting us to reopen the closed-off street that was our set on day one so he could drive down it. Also, trying to explain the scale of the titan to the extras when they couldn't see it for reference was pretty tricky! While we did have a guy on set holding a 21 foot tall pole for framing and reference, it's hard to visualize it in 3D with a stride that, when calculated, would hit around 14-15 feet per step!" We shot three different dogs and chose the featured dog based on their performance. We had a trainer behind the window where the titan would be and another behind the camera, both getting the dogs' attention at the right time. All the explosions were practical and shot in-situation with the actor. Having the actor happy to be onset during the explosions improved the credibility of the final product by capturing real interactions. 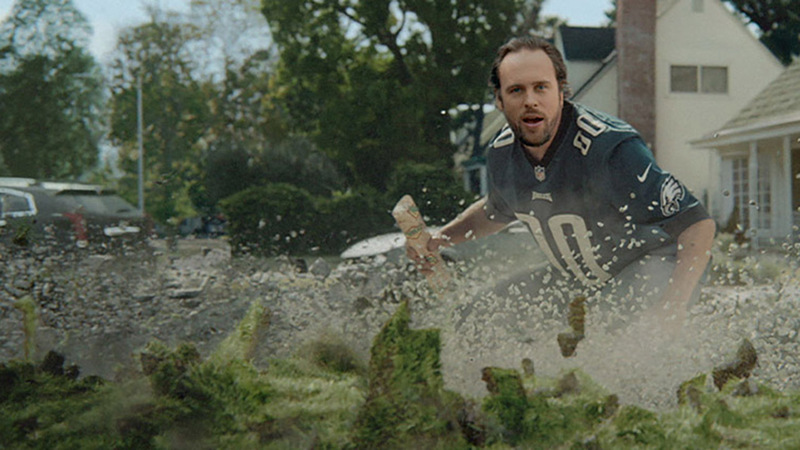 At one point you see his hair flap because of the force from the blast. That kind of material is great as it's entirely authentic. 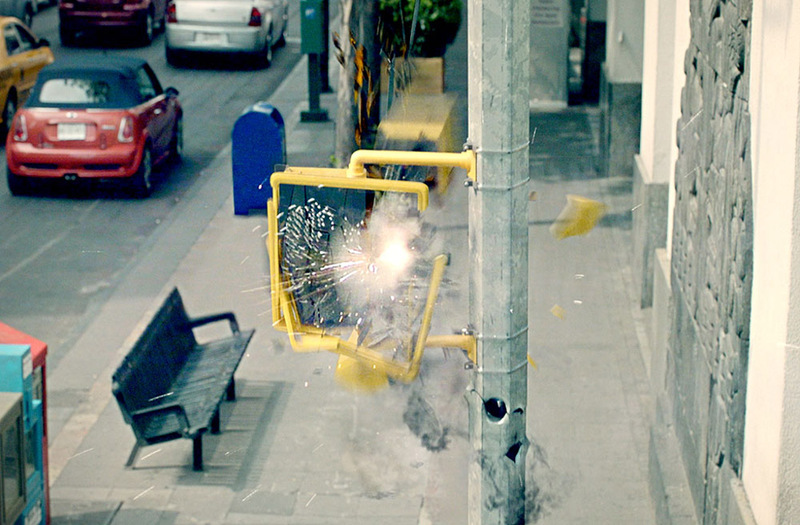 The crosswalk sign was replaced in post-production as it was in Spanish and packed full of earth and other stuff, so that when we blew it up it gave a great explosion. Doing that practically also meant it acted as a great timing reference. In terms of effects, there was a huge practical shoot for the landing scene when the titans face-off. We shot a lot of large scale explosions as well as a dust element with an incredibly brave hero actor - he stood in while all the explosions went off behind him and never flinched. Practically, we shot our hero being lifted into the air using wires to get the appropriate lighting. We then shot clean plates without our hero or rigs. We used the lift plate for timing for animation purposes, then created a CG stand-in to cast the correct reflections and shadows onto our titan. We finally rendered the titan in the foreground and background elements so that the 2D team could peace it together. The final scene pulls the viewer into the cockpit for one last shot of real world destruction before transitioning into gameplay footage. The spot is part of the "Life is Better With A Titan" campaign created by creative agency Heat and directed by Wayne McClammy of Hungry Man.